There was a lot of thought put into naming you. Tulip is an excellent choice. good food but best of all much LOVE. 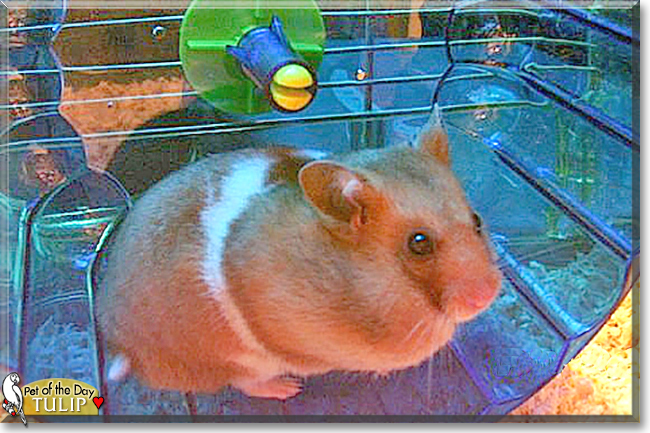 Dearest Tulip, what an adorable Golden Syrian Hamster you are, so cute and sweet-looking! And what a good friend you are to your dear young person. He/she saw you in a cage alone and had to get you! That's such a nice story of how you got the name Tulip.. you came home on the first day of spring and were named for your friend's favorite flower. You are full of energy and make her/him smile with all your antics. You two love each other very much, don't you. What a wonderful love-filled home you share! Congratulations, darling Tulip, on being chosen today's Pet of the Day! We hope you and your dear young friend and all your family and friends are enjoying a fine celebration, full of fun and lovies and all your favorite games and treats, maybe a special serving of wheat bread crust! Hi Tulip! Happy Pet of the Day to you, sweet little one! What a beautiful, most precious Syrian Hamster you are, and so perfectly named, for you truly are every bit as beautiful as the prettiest tulip in the garden, as coveted as the first day of spring! Your human knew the moment she/he first laid eyes on you in the pet shop that you were the one for her/him, and what a perfect match it turned out to be! How lucky your human is, having a furkid as beautiful, as gentle, as sweet and loving as you, Tulip! The joy and love you bring to your human's life is truly a priceless gift to cherish forever! Thanks for the BIG smiles, sweetheart! Reading your human's heartfelt, love filled tribute, seeing your heart-melting photos, has been a real treat! Hope you're enjoying a very special Pet of the Day celebration...munching on wheat bread crusts and spinning on your wheel; cuddling with your human on the couch, watching some TV; being loved and pampered to pieces! Lots of love, snuggles and kisses to you, precious Tulip, our very special and most deserving Pet of the Day, EVERY day!!! And here's to countless more happy days of shared love and companionship for you and mom/dad! Tulip is adorable! What a smart person, you got Tulip a quieter wheel and you know how to take excellent care of your little freind and companion beautifully. I hope you have a very long and happy future together!